Welcome to the TechnoBuffalo Gaming department's favorite video games of 2012. Last year, I was supporting this section all by my lonesome. That meant that I produced a top 11 of 2011 that really only captured my favorite games of the year. This year, the TechnoBuffalo Gaming crew hosts three separate writers. Rather than select 12 games and rank them from better to best, we decided to each pick our top four games of the year. Three writers pick four games, hold on, I need my abacus… that makes a top 12! Two rules for this little contest: no overlap allowed between lists, and games are ranked from worst to best. I also took a glance at the games we all discussed and put together a quick sampling of "honorable mentions." Consider these games you should absolutely check out. Here we go. Joey Davidson's favorite games of 2012. I'm fine with digging into this list with probably the most surprising and least known entry. FTL: Faster Than Light is a small, indie game made by a two-man team and a musician. It features top-down gameplay and tasks players with getting from one end of each sector to the next while fighting off pirates, boarding rebel scout ships and rescuing NPCs from certain doom. This game is insanely addictive, and, looking at my Steam library right now, I've apparently sunk more than 30 hours into it. The music, the aesthetics and the relentlessly difficult formula all call back to an almost lost age in gaming. FTL is beautiful, from top to bottom. It's inexpensive and it's one of most original games I played this year. From unexpected to obvious, Borderlands 2 is basically the antithesis of games like FTL. This big-budget shooter took the ideas of its predecessor and blew them out on all sides. The result was a hilarious, psychotic, visually stunning ride across the world of Pandora. Vault hunters team up to kill stuff, score loot and engage with some of the year's best NPCs. 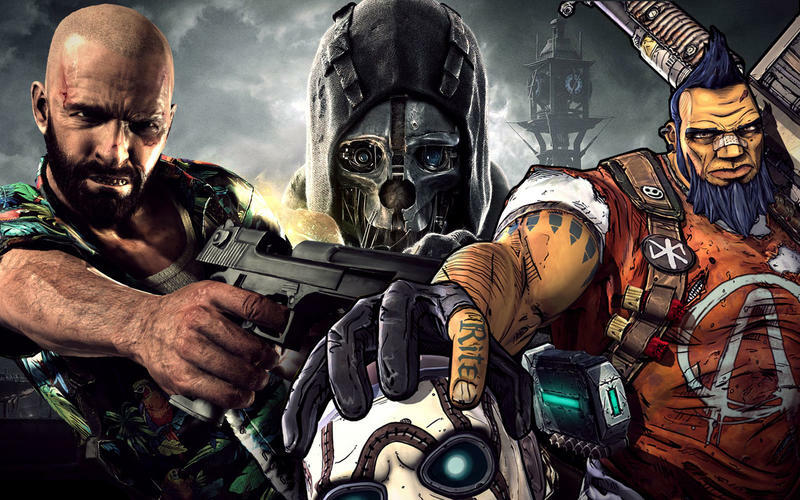 Gearbox deserves a pat on the back for understanding where Borderlands fell short and delivering on this miscues with their first sequel. The DLC has been wonderful so far, and I fully anticipate a few more romps through this violent world in 2013. That's a question that's often been asked, especially during this console generation. If someone were to ask me if games are art after 2012, I'd point them in the direction of thatgamecompany's Journey. This PlayStation Network exclusive is a gorgeous voyage in storytelling, art direction, music and originality. It only lasts two or three hours, but the trip is wonderful. Journey will stand as one of the most memorable games from this era in the medium, and its impact will hopefully be felt for years to come. I can't remember the last time a video game left an impression on me quite like The Walking Dead. Telltale took Robert Kirkman's world of zombies and asked players to make decisions. Tough decisions. Life ending decisions. I feel in love with each and every character in the game. Watching them all eventually succumb to their fates was devastating, and making key choices in their destiny was even worse. The Walking Dead is a wonderful example of video game storytelling, and Telltale nailed the aesthetics, the vibe and the consequence of the universe so perfectly that they deserve every ounce of praise they've received. This game is outstanding, and I gladly call it my favorite of 2012. Eric Frederiksen's favorite games of 2012. There are a lot of comparisons between last year's thriller Drive and independent game Hotline Miami, and they're not entirely undeserved. There's a lot to compare aesthetically. Hotline Miami wears its influences on its sleeve: the "neon-drenched funk" soundtrack, retro-style graphics, and pastel-and-palm-trees art direction all put it squarely into the 1980s. The lone protagonist, capable of extreme violence, too, recalls Ryan Gosling's character in a way. The story is minimalist to the same degree as the old games that influenced it, but for those willing to unravel it, there's an interesting plot about free will there to find. While other games try to contextualize their violence, Hotline Miami does the opposite, first offering only the scantest of reasons for the main character to kill, and then having that character questioned as to whether he has any idea why he's turning all these buildings into pixelated Jackson Pollock paintings. If there's any argument for not judging a game by its box art and commercials, Spec Ops: The Line is it. It's a subtle but unmistakable middle finger to modern war shooters. It plays with the idea of what it is to be a warrior in today's political climate, where you control Walker, a highly trained, smart soldier who wants to do what's right but is only one man with a small crew, trapped in radio blackout caused by massive sandstorms, working with limited intelligence. Over time, it becomes clear that Walker may not be as fit a soldier as he initially appears. It's engaging without glorifying war, something so many other war games can't help but do. I'd been concerned about Max Payne 3 for years. Those first shots of Max—with his hair having migrated off his head and onto his neck—really worried me, along with the move from New York to Brazil and the loss of the series' iconic comic book cutscenes. But, in taking away so many of the things that made Max what he was and putting him in a new, unfamiliar environment, Rockstar highlighted the core of the most beat-up man in gaming, even playing with gaming tropes, using them to get into Max's head. Max himself, unbeknownst to those of us playing Max Payne 2, was there, present and aware, for all those kills, all those pills. And under all this psychological exploration of Max, there's a strong core game. Max Payne is as much fun as it's always been. Remember when bullet time felt fresh and new? Max Payne 3 is here to remind us that when it comes to games heavy with slow-mo bullets, this series is the cream of the crop. The pounding soundtrack by HEALTH and the Tony Scott-style direction round the game out to make Max Payne 3 some of Rockstar's best work this generation. Dragon's Dogma, a surprising new IP coming in at the end of a console cycle, has a slightly different take when compared to most fantasy titles, putting a strong emphasis on large-scale boss battles and intense, deep combat. The combat stays exciting all the way through the game, and the system makes switching classes fun instead of frustrating. In fact, it was enough for me to not only finish the game once, but twice over, including the massive post-game dungeon that really highlights just how well the real-time combat works. The game's story is minimal, but it, along with a strong localization effort from Capcom and some truly atmospheric quests, helped build a world that should stand up to a few sequels. Even as I try to dig into Skyrim's Dragonborn DLC here at the end of the year, I find myself thinking that I'd much rather be taking on a giant hydra using a sword as tall as me or climbing on top of a chimera and hacking off its snake-head tail. Ron Duwell's favorite games of 2012. Even in a world where the West dominates sales and pushes the industry walls further than ever before, we should not forget that Japan still has the ability to turn a ridiculous idea into a wonderful little video game. Take Tokyo Jungle, for instance. Humans have vanished from the Earth, leaving the wildlife to roam the streets of a ruined Tokyo, each species vying for the top link on the food chain through evolution from generation to generation. It's a ridiculous set-up that works on all levels, built with a classic arcade mentality in mind where progression is measured through self-improvement and incremental stat bonuses. It's also a firm reminder of what a video game really is supposed to be about, fun! Sure, there are multimillion dollar projects which might have been "technically" better video games than Tokyo Jungle, but at the end of the year, I'm still loading up my save file and leveling up my Golden Retrievers, while a large majority of the mass market appeal AAA games have found their way onto my shelves, most likely to never be played again. Of our twelve choices, five are entirely new franchises, four are classic series given new life after lying dormant for quite some time, one is a successful comic book adaptation into a new idea. If you look beyond the AAA releases of the year, you'll find 2012 was a wonderful time for originality, contrary to popular belief, and none better summed that up than Dishonored. Dishonored finds a happy ground between what gamers see as original and what the casual fans see as approachable. It's a first person experience which can be played both as a straightforward game or an experimental toy-box of fun abilities for bringing all kinds of death on poor city guardsman. Bethesda wants to be a bigger player in the publishing market and after a few failed attempts, they've finally found an original franchise worth sticking to. The rewards they took on the risk of Dishonored will pay back ten fold down the road, and gambling on a new franchise like it proves once again to be a wise investment more publishers should take the time with. To me, Mass Effect 3's only crime is that is wasn't as good as Mass Effect 2. Less interesting party members and fetch quest missions took it one step too far from the original vision, and yes, the final mission coming up way short of the standard its predecessor had set. However, when Mass Effect 3 is on…it's on. Popular characters making the ultimate sacrifice, bodies piling up in refugee camps, Reapers laying waste to entire worlds, and every single second of the thrilling Tunchaka mission. BioWare's vision of a galaxy on the brink of catastrophe could not have been realized any clearer. Not to mention the combat is the best the series had seen yet, BioWare finally managing to make the final push into action game territory. BioWare is also still supporting the excellent multiplayer portion of the game with frequent DLC packs and bi-monthly weekend events. There is no question that the first-person genre dominates the video game industry these days. Modern warfare shooters fly off the shelves in record numbers, and even RPGs have gamers staring down the ironsights. It's also become a bastion for reviving any old franchise into a guns blazing shooter, a trend that has irked the fans of other genres, especially strategy games. Both EA and 2K Games took a stab at reinventing classic strategy franchises as first-person shooters with Syndicate and XCOM, respectively. The only difference is EA continued with their plan and Syndicate tanked, while 2K Games listened to gamer outrage and adjusted their strategy, turning to a top notch strategy developer to create one of the best and most accessible strategy games in years. XCOM: Enemy Unknown is not only 2012's most fun and rewarding game for me, but it also proves there is plenty of space on the market for other genres besides shooters. Sleeping Dogs, Lollipop Chainsaw, Far Cry 3 (get this one, folks), ZombiU, Paper Mario: Sticker Star, Halo 4, Fez, Mark of the Ninja and Nintendo Land.